With most political analysts still arguing that returning to Communism is not a real prospect in Armenia, the local survivors of the once omnipresent Soviet Bolshevik party are making increasingly bolder statements about their chances of success in next year’s parliamentary vote. The uplifted mood of the Communist Party of Armenia (CPA) – either by way of coincidence or as a matter of course – appears to be conditioned also by broader geopolitical moves in the former Soviet space where a Russia-led reintegration process is gaining momentum to shape new economic and political alliances two decades after the USSR’s demise. Advocates of the reintegration plan, including Russia’s current prime minister and ‘president-in-waiting’ Vladimir Putin, Kazakhstan’s longtime ruler Nursultan Nazarbayev, and others have argued that the emerging Eurasian Union is an answer to global economic challenges. Others, though, argue that it is an attempt to plunge the nations back into imperial times, and any move in that direction is largely perceived by a majority of people in post-Soviet states as having the ‘Color Red’ attached to it. The CPA remained a leading political force in Armenia even after the disintegration of the Union in 1991. It boasted a sizable representation in parliaments and, in fact, had the second largest faction in the legislature up until 2003 when it fell short of the five-percent hurdle in the elections. The Communists began to lose their political clout and in fact fall apart following the death of their charismatic leader Sergey Badalyan in 1999. Splinter movements inside tore the party asunder leaving the core that remained unable to hope for any considerable popular support. The latest mass event organized by the CPA in Yerevan November 29 was not the first one during the years of political obscurity, but the old Soviet-era mottos and appeals to working-class people may have sounded somewhat fresh against the backdrop of rising anti-capitalist campaigns around the world, including in leading industrialized nations of the West, such as Occupy Wall Street. 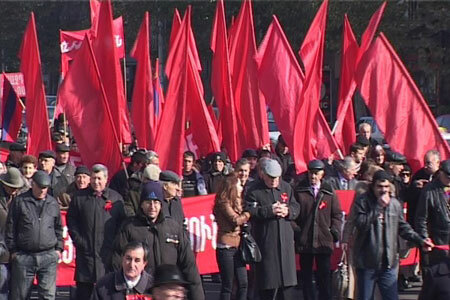 Tuesday the CPA gathered its few supporters in central Yerevan for a procession to mark the 91st anniversary of the establishment of Soviet order in Armenia. It was also a way for the party to remind its potential voters of its existence in a pre-election year. People with banners reading “Socialism”, “Long Live the Communist Party of Armenia”, “Down with Capitalism”, “Forever with Russia” and other similar slogans marched through downtown Yerevan towards the square named after Stepan Shahumyan, a Russian-Armenian revolutionary who made his mark as a Bolshevik leader throughout the Caucasus early last century. CPA leader Ruben Tovmasyan believes that against all odds the Communist will make it to the National Assembly of the next convocation – for which elections will be held in May. “People now finally understand that it is impossible to live under this order. People abandon the country in search of livelihood, and only Communism can save our country,” says Tovmasyan. Typically – and, it seems, even more so brazenly after the rising “Back To USSR” moods in some parts of the former “Empire” – the Armenian Communists are favoring closer relations with Russia as a way for their nation to survive. Tovmasyan stresses that his party will do everything for Armenia to become a member of the Eurasian Economic Union. While he is convinced that by joining the Russia-led union Armenia will be able to create new jobs and extend to new markets, most economic and political observers see minimal economic gain from such a step, while a considerable amount of risk of losing political sovereignty would be involved. The Communists are not alone in Armenia in espousing such reintegration. New Times Party head Aram Karapetyan, a man with Russia-based capital, also believes that Armenia should unconditionally become a member of the nascent Eurasian Union. However, analysts say even in that case socialism and communism will have very little prospect, if any at all, of reviving in Armenia. Political analyst Yervand Bozoyan says attempts to build all-communist societies failed not only in the Soviet Union, but also in China, which, while remaining a state ruled by a single party, still had to opt for a certain degree of private entrepreneurship as a way to sustain its economic growth. “Social justice can only be present in democracies, but democracy is impossible without property rights and free economic competition, which transcends the communist ideology,” he said. According to the analyst, while socialism is actively grappling with capitalism around the world at present, that struggle can only be of a short-term nature and will be conditioned by the effects that the global storm has had on the world economies.